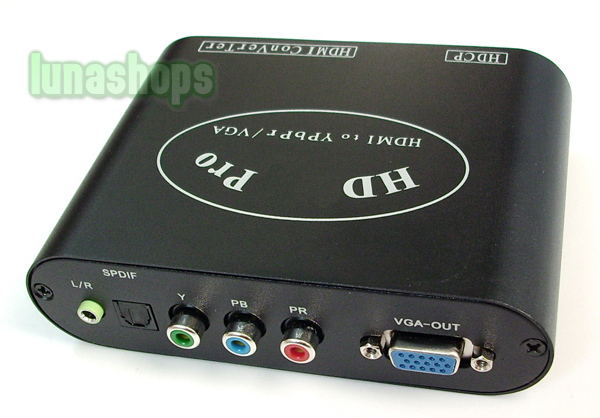 The HD-E766 HDMI Converter HDMI to YPbPr/VGA HD HDTV BOX is a revolutionary product that allows you to use the full resolution (up to 1080p) of any HDMI device on a CRT projector, PC monitor, older HDTV/Plasma TV, or any other device without a HDMI input! If you own a high quality projector/monitor/TV that does not have a HDMI connector you need this device! And this model support SPDIF output. The HD-E766 HDMI Converter HDMI to YPbPr/VGA HD HDTV BOX allows you easily add digital devices such as HD-DVD/Blu-Ray players, PS3, X360 Elite, Satellite/Cable HDTV set-top boxes & HTPCs with HDMI graphic cards, to name a few! Simply connect the HD-E766 HDMI Converter HDMI to YPbPr/VGA HD HDTV BOX into your projector, your HDMI device into the HD-E766 HDMI Converter HDMI to YPbPr/VGA HD HDTV BOX, and be amazed by the difference ! 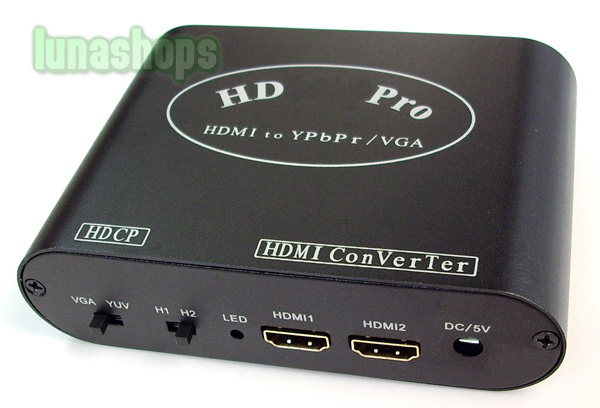 The HD-E766 HDMI Converter HDMI to YPbPr/VGA HD HDTV BOX delivers a razor sharp picture with absolutely NO video noise. The picture quality improvement as compared to RGBHV analog video is immediately obvious, providing an amazingly clear and detailed picture! HD-E766 HDMI Converter support 2 Channels HDMI input,1 YPbPr and VGA port output.Simply switch the Input Button to HDMI1 or HDMI2 for choosing the channel. Please Note: The packing and power adapter may be changed by the factory. 1. 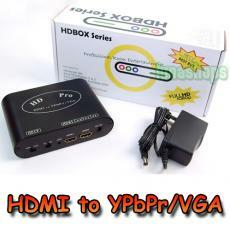 I have a CRT TV set which is have the YPbpr port, can i buy HD-E766 HDMI Converter? 2. 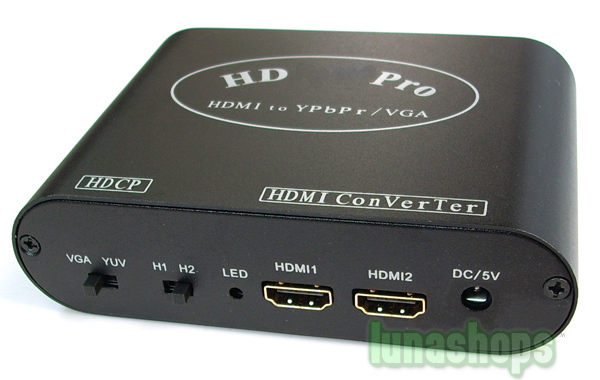 My projector is VGA port input, Can i use the HD-E766 HDMI Converter? 3. 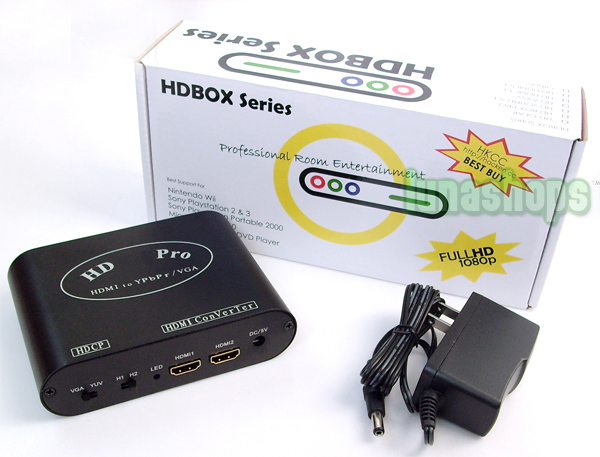 Can i get the sound divided from the HD-E766 HDMI Converter? the SPDIF port and get the 5.1 Audio sound. 4. I have xbox 360 , ps3 console and a VGA port monitor, and you connect them to the monitor in the same time?